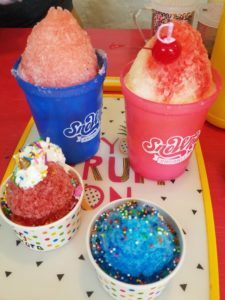 SnoWhat Snoballs offers a fresh new twist on a classic treat! 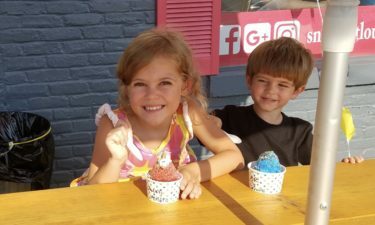 I’ve been hearing a lot about SnoWhat Snoballs, so on a 90-something degree night when my kids had some things to celebrate, we decided this was the perfect place to try! As a bonus, it was kids eat free night! They have specials throughout the week, like donating money to a charitable cause, kids eat free, or double punch days for loyalty members. Check out their Facebook page for more info! 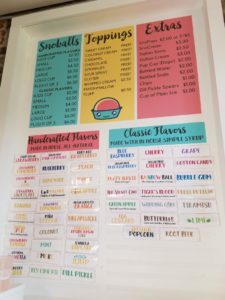 SnoWhat Snoballs started as a food truck a few years ago, but this year opened up their first brick and mortar, although you can still find their food truck throughout the city on a regular basis and often at special events! They pride themselves on having special “snow” that is softer and helps the flavors absorb into the ice instead of sinking to the bottom. Their flavors are handcrafted, made in house with fresh ingredients with nothing artificial! All of the snoballs are pretty much allergy free– including nut, dye, and gluten free! Some have dairy but there are plenty of options without. My daughter is allergic to peanuts, so we have a hard time finding a place to go out for a treat and feel fully comfortable. No worries here, so we were so excited to find this place. As you arrive at Trevilian and Poplar Level, the store is right on the corner. There is minimal parking, but drive around back or try another lot close by if the lot is full. As you walk in, the counter is right in front of you and all their menu choices on a board to your right. There were so many options to choose from that it was really difficult! They do allow you to sample any flavors that you’d like and we saw some people taking advantage of that option. We eventually chose our flavors (and remembered some we wanted to try for next time!) and placed our orders. One thing I really loved was that they have quite a few toppings that are free to add, such as edible glitter, sprinkles and chocolate syrup. If you ask, they’ll even make your snoball into a unicorn, as they did for my daughter! SnoWhat Snoballs offers an optional souvenir cup that can be refilled at a later date for usually half price (sometimes more at the food truck or at special events). We decided since we’d heard such good things about it that we needed to get those, especially since the said on kids eat free nights, our kids would still get theirs free with the refill! Plus, they’re color changing cups! How cool is that? After getting our snoballs, we tried to head up the few steps to their small eating area, but it was full. That was to be expected on such a hot day with kids eat free. Luckily the picnic table outside was open, so we sat down to enjoy our treats. My son got the blue raspberry with sprinkles, my daughter got cherry, turned into a unicorn, I got pineapple upside-down cake, and my husband strawberry banana. I think mine might have been the winner – seriously, it tasted JUST like the cake! I have no idea how they did it! My kids loved theirs as well. My husband enjoyed his, but he felt it could’ve used a bit more flavor. He did mention though how you could see the real specs of strawberry in his and on mine, when I got to the end and it had melted quite a bit, you could see those flecks of pineapple from the juice! These are real, legit, natural flavors that they use to make their syrups! Overall, I highly recommend SnoWhat Snoballs. We all enjoyed it and it was a nice, lighter treat compared to the typical ice cream on a hot summer day. Plus, there is the added bonus of it being natural! Plan a trip there soon! Kids eat free Tuesdays go through 7/31/18.